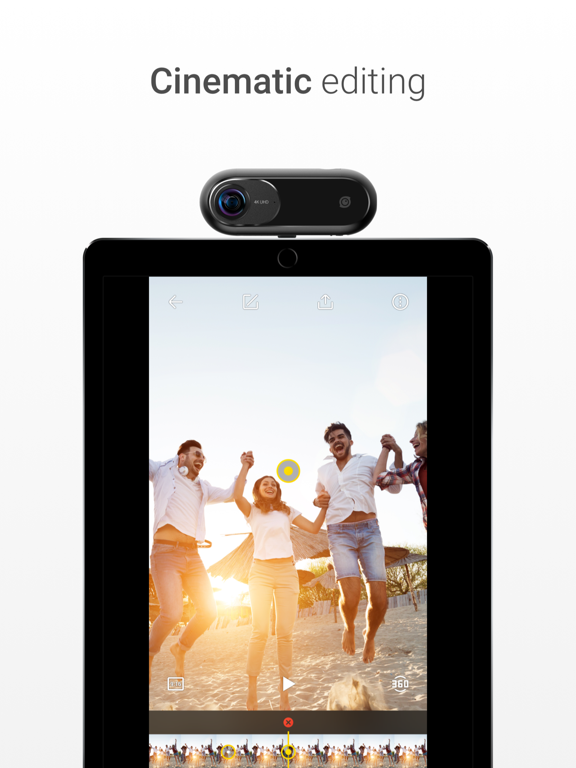 The Insta360 ONE camera instantly turns your iPhone or iPad into the ultimate tool for shooting, sharing, and live-streaming in 360°. 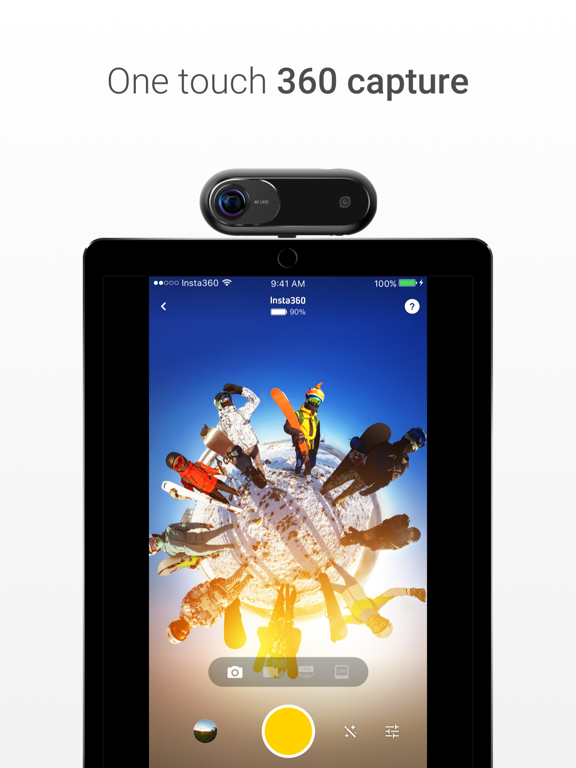 Simply connect the camera to the Lightning port of your iOS device and load the Insta360 ONE app and you're ready. 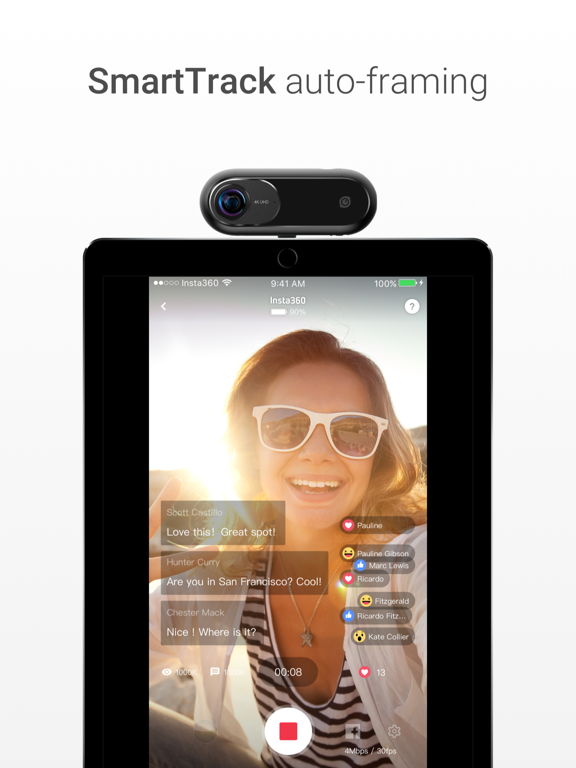 You can also use it as a standalone camera and control it with Bluetooth. This bundle includes a selfie stick, Insta360 bullet-time handle, and more. The unique FreeCapture mode lets you shoot first, point later. First you capture a full 360° experience. Then you play back your footage and reframe the highlights in a standard 1080p format—straight from your iPhone or iPad. You’ll never miss a detail in any direction. With the ONE Camera's “FlowState” stabilisation technology, you can capture hypnotically smooth video, no matter what you’re doing. Even your dog can shoot like a pro. Cable length: 8 cm/31.5 in. What I love about the Insta360 One is that it's not just for 360 photos and videos. When you attach it to the included selfie stick, and shoot a video, it look What I love about the Insta360 One is that it's not just for 360 photos and videos. When you attach it to the included selfie stick, and shoot a video, it looks like an invisible flying camera. It also has incredible stabilization that makes it look like the video was shot by a cameraman with a crane or jib. The most important feature is that you can shoot first and point later. While going snowboarding for example, you can simply hold the selfie stick with the insta360 one attached and then forget about the video. At the end of the day, you just attach the camera to your iPhone, tap on the Freecapture button, and move your iPhone around to capture the perspective that you want, just as if you had been taking a video of yourself with an iPhone at the time you were snowboarding (tip: it's best to do this on a swivel chair). This creates amazing possibilities. For example, you can shoot a first person view, and then pan or cut to a view of yourself to show your reaction. These are just some of its features, in addition to shooting 360 photos and 360 videos as well. :) The downside is that you do have to take a few minutes to export the video, but that's not much different compared to editing the video in iMovie or some other app. They still need to improve some features and the software to get the five stars, but is small, easy to use, take cool pictures, videos and time lapses. Great fo They still need to improve some features and the software to get the five stars, but is small, easy to use, take cool pictures, videos and time lapses. Great for b-roll It's always on my backpack. This camera has some of the most awesome features I've seen on a 360 camera and it's so user-friendly! Bullet time is AMAZING! I love the E-Hollywood Glam Cam This camera has some of the most awesome features I've seen on a 360 camera and it's so user-friendly! Bullet time is AMAZING! I love the E-Hollywood Glam Cam style images it can take. Stabilization is the best and the ability to go back and create a regular video 100 different ways from the same 360 video is genius. I'd give this gadget 10 stars if I could. Thanks, Apple, for always keeping me one step ahead of my friends when it comes to the next best thing! I LOVE IT! Is this review useful?SO COOL!!! One of the best iPhone gadgets I have gotten so far! Very verstile, works great with iPhone & seamless in-app editing. It’s like having 10 cameras with just the One. What a sweet little camera. I did a lot of research before buying the Insta360 One and I am so glad I got it. Here is why: Flow State! I have a bunch of GoPro’s What a sweet little camera. I did a lot of research before buying the Insta360 One and I am so glad I got it. Here is why: Flow State! I have a bunch of GoPro’s and currently using the Canon G7X Mark II for my videos. I have always struggled with the workflow post recording. I find it so time consuming and cumbersome to download the videos, then edit them, before posting that I don’t even do it. I have 2 vacations still on memory cards that will probably never get done. The Insta360 One FlowState have changed all that. The app makes it so easy to edit the videos. You can set transition points anywhere in the 360 video and it will automatically, and smoothly, make that the center of focus. It also has active tracking which takes all the work out of having to plan your shots. With my GoPro’s I was always worried if the shot was in frame. With the One it didn’t matter where the lens was pointing since it records in 360. Use active tracking and you got your shot. 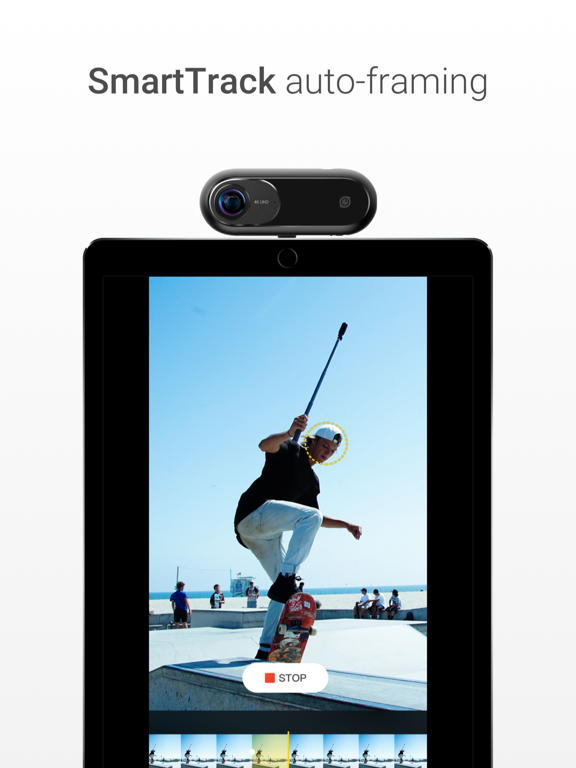 Then my favorite is the View Finder mode where you can manually edit the 360 videos. It’s like having 10 cameras with just the One. This camera is ideal for social media. Put it on your phone, record, edit, and post. It’s that easy. The app loads directly to Instagram and Facebook. 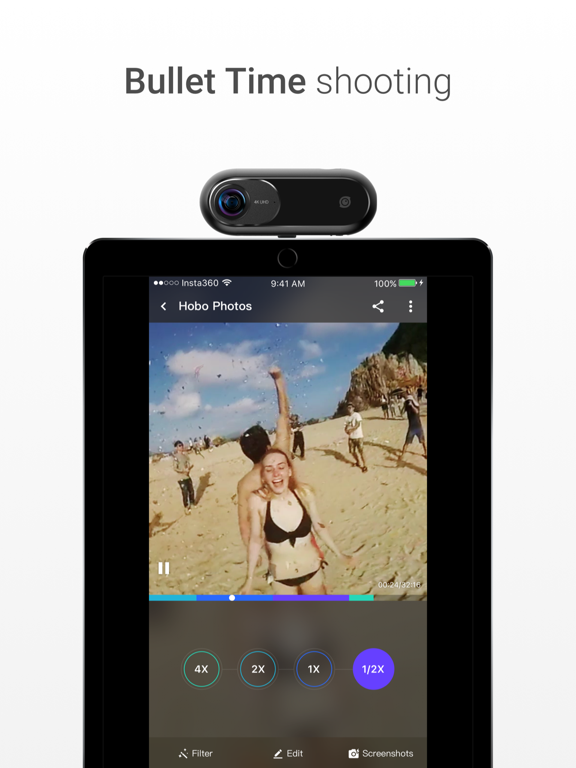 It’s also the only 360 camera, so far, that allows live streaming. I have not done that but I can certainly say posting to Instagram is a breeze. This camera does everything I need without the tedious post editing I dread with my other cameras. I am sure future software updates will only make this camera better than it already is. Is this review useful?It’s like having 10 cameras with just the One. I purchased this at the apple store and used this summer with amazing results until I used it underwater (with the original underwater case which I tried before I purchased this at the apple store and used this summer with amazing results until I used it underwater (with the original underwater case which I tried before). water went in and the camera died, emailed the service and if I wanted it checked and/or repaired I have to ship it to Honk Kong.